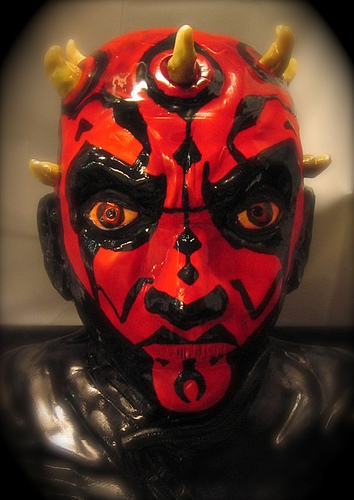 This is one thing which every Star Wars fan would want to taste, the sweet taste of dead Darth Maul in the form of a cake which will blow away your mind with its fantastic taste and give you a relief that at last the Darth Maul is dead. 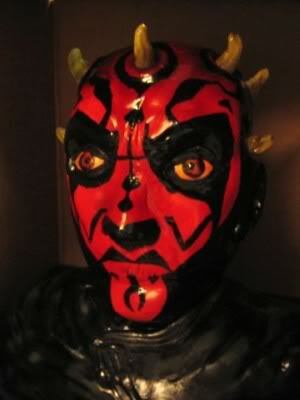 Being one of the most feared and the main antagonist in Star Wars Episode I: The Phantom Menace, Darth Maul’s face and viciousness had made everyone go under their blankets and even after he killed by Obi-Wan Kenobi, People still feared that whether Darth Maul will return or not and he returned but not to serve your heads off but to give you the treat of a life time in the form of this exquisite tempting cake which no one will resist. Made up of dark chocolate with different flavors in the form of his eyes and those things protruding from his head, this cake is already making my mouth watered. I know you will get scared on its first look but the aroma coming from it will start tickling your nostrils so badly that you will just pounce on it but be careful as only the head part is the cake, the neck is just a support on which the cake is placed, I hope you don’t end up swallowing the support too. Debby has put a lot of hard work in making this cake which has finally paid off tremendously. To find more information on how she made this and also about the ingredients of this exquisite, unique and tasty cake you must have to contact debbiedoescakes. Besides the Jango Fett Cake, you can get more such tasty cakes to kill your sweet tooth as Ghostbusters-Cake or you may like Ouija Board Cake too as interesting.